I've been compiling pictures for this post for a couple of weeks now…and I didn't mean for it to get so long. 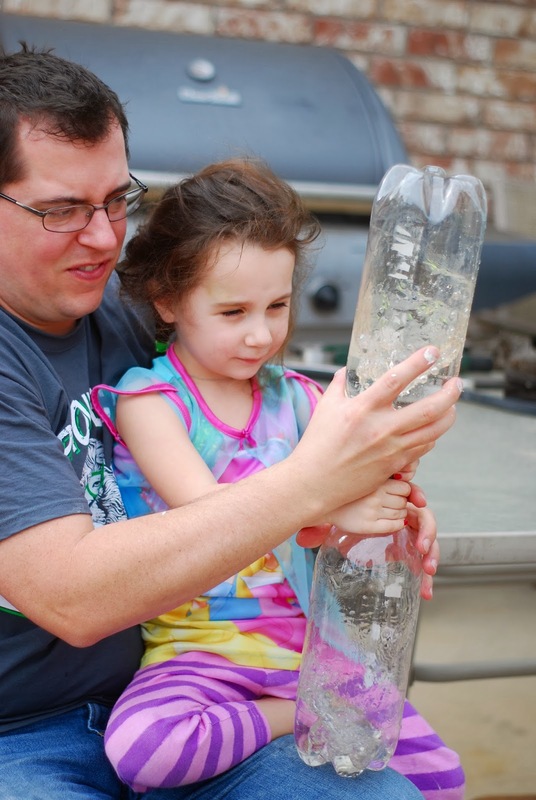 I've decided I like doing these 'homeschool lately' posts….to somewhat document our homeschool days, but mostly…to document my thoughts and such. I feel like it will be good to be able to look back on as encouragement for myself when we hit future homeschooling 'bumps in the road'. This is all a major learning curve for me. And the main thing I think I've learned is that….as soon as I get it 'figured out'….it's probably time to make a few tweaks here and there and to 're-figure' it all out. Her needs change…the rest of the family's needs change….her strengths and weaknesses change….and we just have to flow. A couple of weeks ago we had a little store to practice/learn how to add 2 digit numbers without regrouping. I was so very impressed with this. 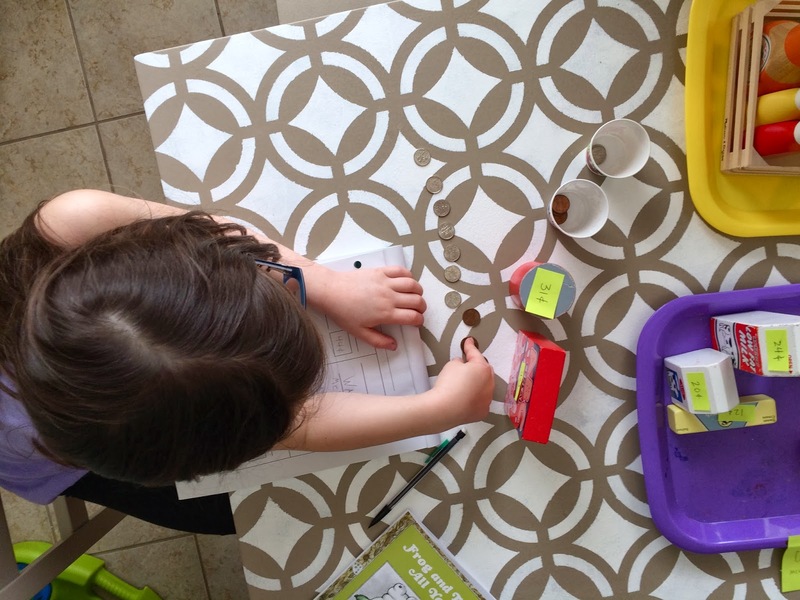 I was nervous to teach it, feeling like it was such a big concept….but she was adding the numbers in her head and counting out the correct money (dimes and pennies) and I didn't really have to teach her. (also to note….that while she did do this wonderfully that day….as days have passed and as we continue to practice this skill….some days she does struggle with it). We always (other than the store) do math in the school room. 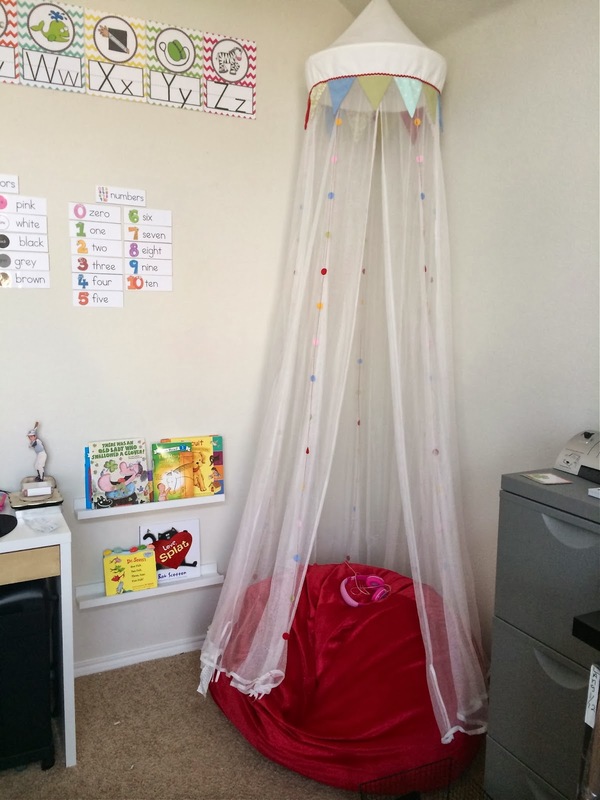 This is the one scripted curriculum we use and we do it first thing while Nolan is napping….because I just need the structure and whatever supplies and manipulatives we need. For our other subjects….we may use the school room or venture out to the rest of the house. What's the point of schooling at home if we're always at the desk?! 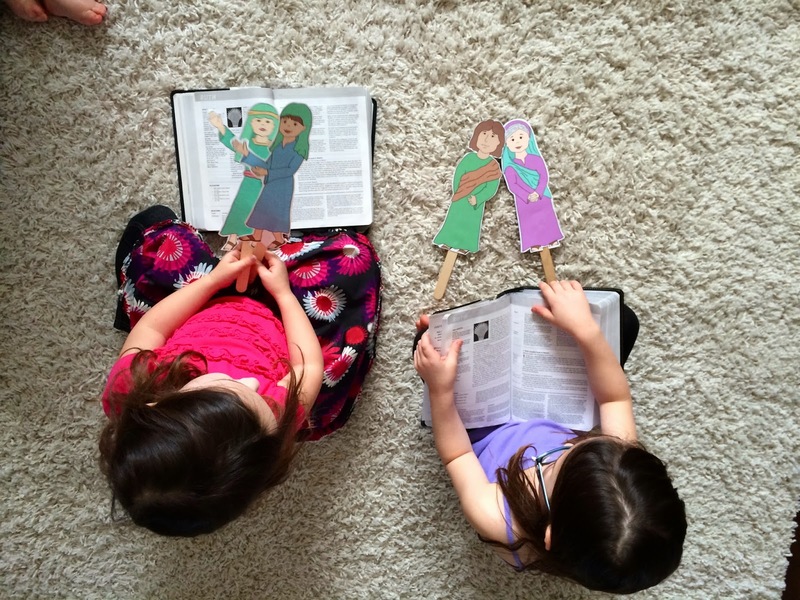 For Bible one week, we read about Ruth and Naomi. It is a good story, but kind of long and with no pictures. So I found these little paper dolls from Danielle's Place and printed and cut them and mounted them to the popsicle sticks. The girls loved this. I am guilty of just running through the bible story and not focusing like I should and I've just started to feel very convicted about it. For instance…I'll spend all of this 'extra' time working on things to help promote her reading and writing if I think she's struggling in that area…..and yet, I don't spend an extra second preparing for teaching her the Word. So…. 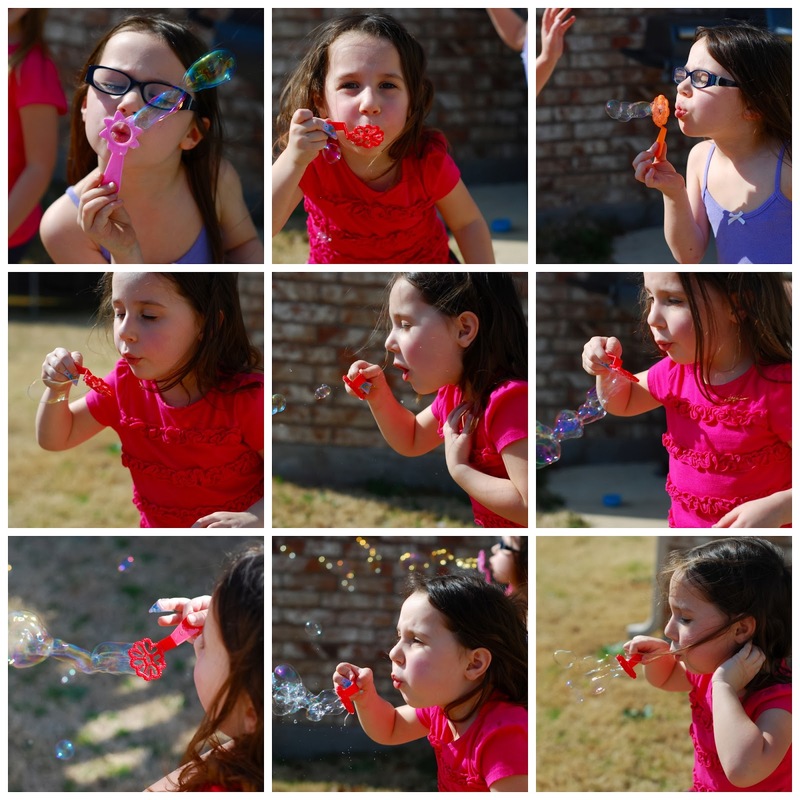 We blew bubbles one afternoon and observed how the wind blew them. The first time I did this was for Valentine's Day. And I mentioned, then, how I wasn't exactly sure of the point of this…but did it anyways. Well now I feel like I am starting to see a point. 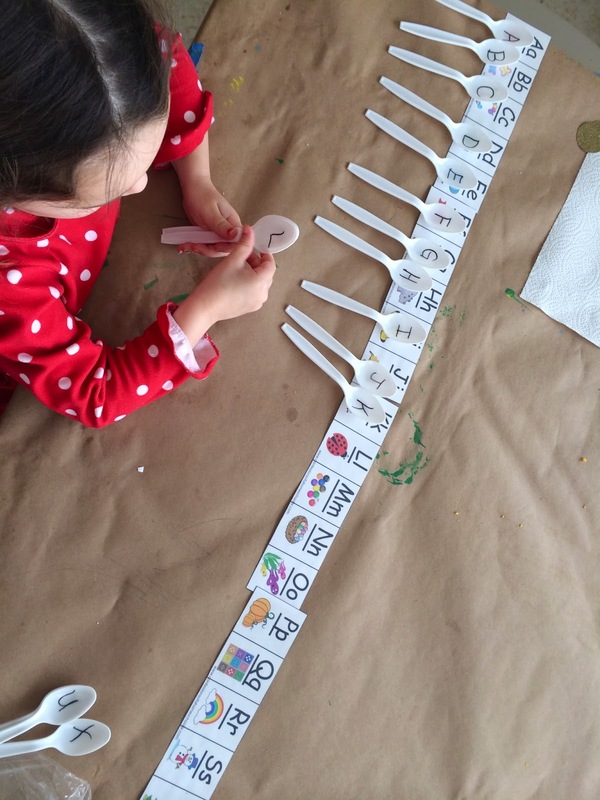 Just her being able to see words with pictures (for Valentine's day there'd be a picture of a heart and the word 'heart' written beside it)... or just reading and writing her sight words. Last week, I put up the St. Patrick's day themed pictures, but they had her sight words on them. She'd read them and write them. Then after she was done recording them on her sheet, she read them again. Just changing up and reinforcing something we do anyways. She even took Nolan along for a ride while trying to find all of her words. I've talked before about how I've had the best of intentions of making lesson plans for her, but have still yet to do so. I really need to step it up, though, because one day last week she kept on asking me over and over when it was going to be her to do school. I kept putting her off like I usually do because in my mind, I think, "if I can just get finished with Parker's work we'd be done". Well….she started crying a little. 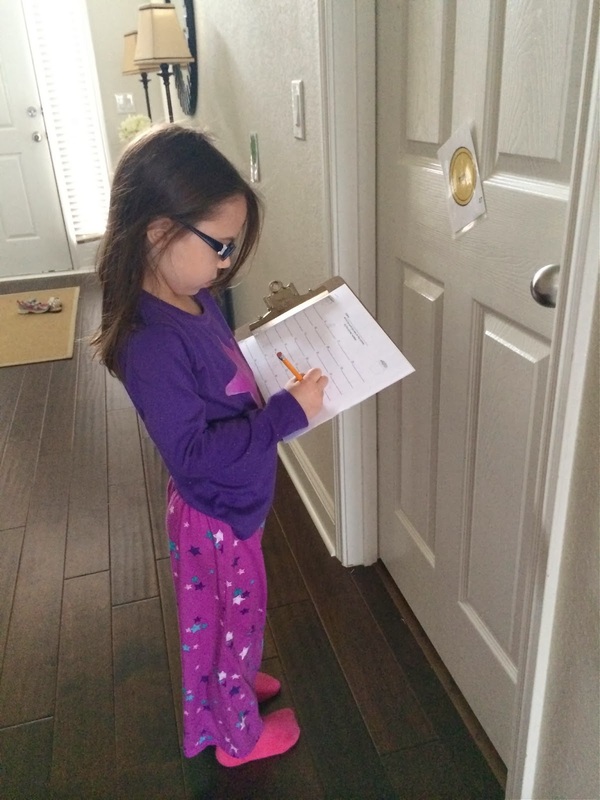 It hurt her feelings and she really wanted to do her own school work. Thankfully….I had a few 'ready to go' things for her to do in my filing cabinet. This made her day. It was so sweet. I also think Parker enjoyed a break to play with toys and enjoy a little iPad time. So ultimately- I think this will be very good for us…I just need to get my act together! For a lot of the science videos or experiments, Bible, and reading books aloud….then she participates if she's interested. I think I was over thinking it a little (like I do a most things)…and just wasn't sure what I needed. I thought I didn't need an alphabet since she knew her letters….but I've found that now I do want it up there for Grace. I didn't want to put the 'colors' on the wall because she 'knew' her colors. And she can even mostly recognize them when reading. But she can't spell them. And not that I expect her to at this point…but sometimes she needs to spell them in math and so there they are…displayed for her to see. Shapes. Just a good reference. Days of the Week. We have a calendar, but she has to write the day in math and so this just makes it a little more accessible. I'm not sure if I even posted a pictures of this….but it's our "Cozy Corner". It's meant to be for 'free' timer, or centers, or reading. So far it's been used by Grace to watch the iPad. So….we'll get there. Very slowly, but surely. This guy came along for the ride when I wanted to snap a few pictures. And the Word Wall. We have a file folder that we use as her Word Wall for school which works just fine. But since reading and writing was something I felt like we were struggling with a little, I wanted to do a little more. And now with all of this 'extra' stuff I've done in the school room….I have to openly and honestly report that Parker is pretty much unimpressed with any of the things I've added. In my mind, I thought she'd think it was neat and fun to add some color to the walls. But nope. Not at all. And that's important for me to remember. But for this right now…I feel good about the things I have up there and I can already see how they've helped her. And that was the goal! Well, I'm certainly impressed! I think it's paying off with all your hard work too! You have amazing smart children! Loved all the pictures too as usual! love ya, give all a hug for me.